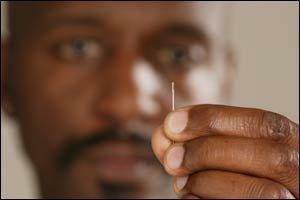 Last week we discussed "The World's Smallest Engravings". This week R.V. 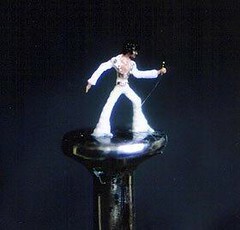 Dewey forwarded an ABC News segment about the world's smallest sculptures, created by an amazingly talented gentleman named Willard Wigan in Birmingham, England. The gentleman you are about to meet can neither read nor write! This is a wonderful video of hand carvings the size of a blood cell. Is it really possible? Evidently it is. Enjoy! 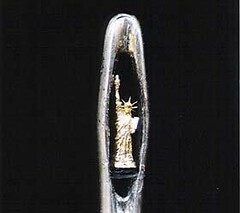 This man can't read or write but he can carve out the Statue of Liberty inside the eye of a needle. 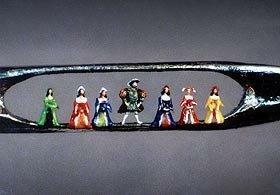 His sculptures are so small that he even thought he may have accidently inhaled his Alice in Wonderland piece. His life's work was sold to a collector for $20 million. Especially impressive was the Charlie Chaplin sculpture that was balanced on the tip of an eyelash. The hoaxbusting web site Snopes says Wigan is the real McCoy. The following was taken from Wigan's web site. Many are even smaller still, with some being completely invisible to the naked eye yet, when viewed through high power magnification, the effect on the viewer is truly mesmerising. He works in total solitude at a quiet retreat in Jersey mainly at night when there is a greater sense of peace in the world and less static electricity to interfere with the immeasurable precision and tolerances required to create the pieces. 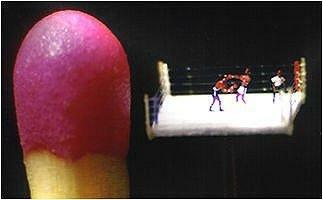 The smallest sculptures can only be measured in thousandths of an inch which is why they can sit, very delicately, on a human hair three thousandths of an inch thick. When working on this scale he slows his heartbeat and his breathing dramatically through meditation and attempts to harmonise his mind, body and soul with the Creator. He then sculpts or paints at the centrepoint between heartbeats for total stillness of hand. He likens this process to "trying to pass a pin through a bubble without bursting it." His concentration is intense when working like this and he feels mentally and physically drained at the end of it.